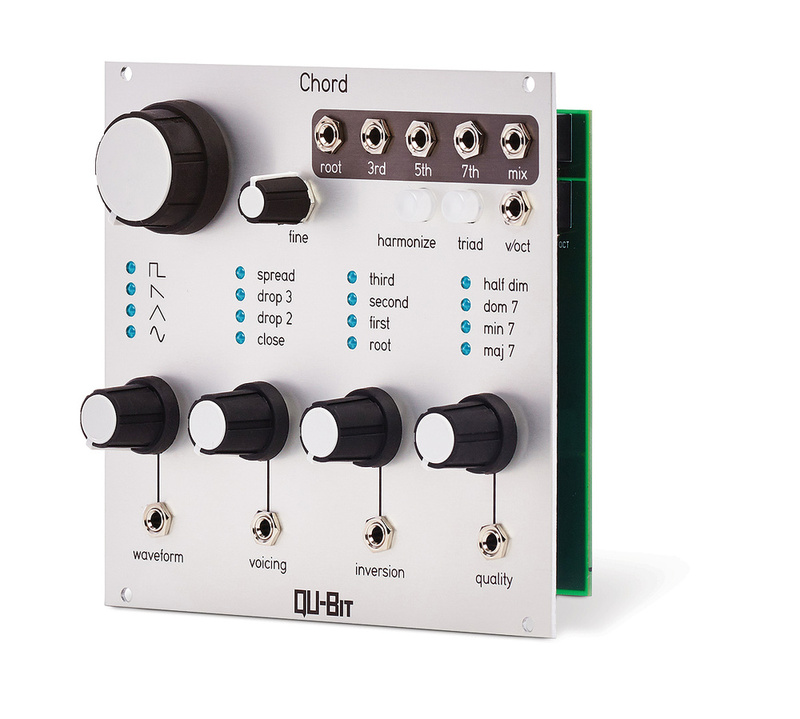 The Qu-Bit Chord promises what can sometimes be tedious to set up within a modular: easy polyphony. 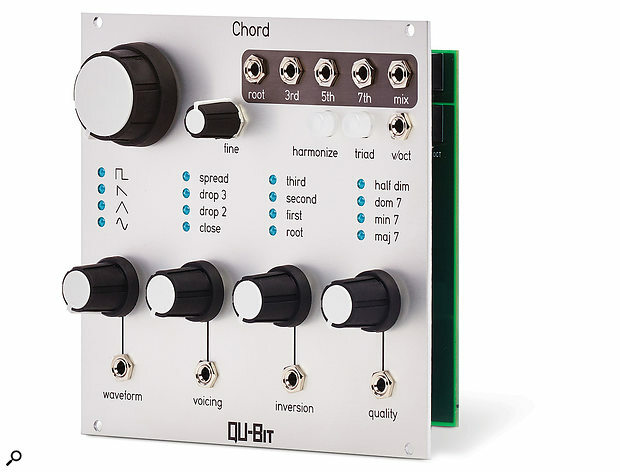 Contained within its modest, skiff-friendly, 28HP Eurorack frame is a four-voice oscillator. Each voice is present at a dedicated output and also at a summed socket (all mono). These outputs are at the top right of the module and are musically labelled; root, 3rd, 5th, 7th and mix. Immediately below the mix output is the V/oct input that provides the Chord with a root note from which to calculate the harmonies it generates. The module provides no shaping of the sound beyond waveform choice — there are zero envelopes or filters present. Instead, you feed the four outputs to, for example, four low-pass gates and then let these handle the actual time-variant timbre manipulation. The waveform selector morphs between sine, triangle, ramp and square wave. Where other oscillators present you with three or four choices accessible through a stepped rotary, this continuous, stepless knob means one can dial in very subtle changes in timbre. Handily, this control is CV-addressable via a socket below the chunky knob. Next to the waveform selector, we are presented with the voicing control. This controls the spread of notes produced by the module; how clumped together or spread out they are. At its minimum travel, a C maj 7 chord would be voiced C, E, G, B, with the notes as one would play the root inversion on a keyboard. Drop 2 voicing would drop the G down an octave, Drop 3 would drop the E down an octave. The last option, Spread, would drop the root C down an octave whilst shifting the B up an octave. All of this complexity is tweakable via the knob or CV. The inversion selector is much easier to understand than the voicing. The knob here simply selects which inversion of the chord is played, from root to 3rd. The designers have, again, blessed us with CV control. Move the knob up a teeny bit and you get a min 7, which would be C, Eb, G, Bb (if the root note was a C). Turn it higher and dom 7 and diminished chords are there, jazzing away. But if this is all getting a bit too chordal theory for you, don’t worry. Qu-Bit have a little button just above the quality selector labelled ‘triad’ which kicks that funky 7th out of the mix output so you can have your basic, rocking three-note chords. Next to this is a harmonise button which will “automatically harmonise diatonic and modal interchange chords of the major scale based on the voltage present at V/oct.” Basically, it treats the input as a bass note and attempts to intelligently harmonise around it instead of merely stepping up each interval uniformly. Where it starts is also based on the biggest control on the unit, the coarse pitch knob, which is both confusingly label-less and bereft of CV socket. Finally, next to that is a knob labelled ‘fine’ which woefully didn’t automagically make me more attractive, but did enable me to fine tune the unit to sing with my other oscillators. Once you start controlling the chord type, voicing, spread and waveform by CV, you realise that what at first seemed like a little bit of a cheating module (‘Chords! In a box!’) is anything but that. The Chord can deliver ambient, evolving landscapes that drift in musically pleasing and harmonious ways, taking tens of minutes to change. It can also bleat like a broken modem singing deathcore Sinatra. It’s up to you. It is a preternaturally flexible module that does not let its inherent musicality prevent it delivering utter madness. I only have a few niggles with it. Firstly, I would love the individual intervals to be removed from the sum output when plugged in, like on an 808. If that could be on a jumper or, even better, a front panel switch, great. Secondly, I love that the quality (chord type) control is CV-addressable, but I would prefer that the actual knob be stepped. If I’m playing live, I think I would prefer the certainly of clicking into major or minor versus having to squint. Or how about just one switch that does that, for an instant middle moody bit? Lastly, if one could choose different tunings/scales for the intervals produced, whole new worlds of harmony would open. I dream of a Chord throwing out Arabic or Pelog harmonies. But those are minor criticisms against a major piece of gear that I’m sure will earn its place in many a modular setup. If you’re looking to add polyphony to your modular, just give the Chord a triad.